Modern style, vibrant colours, a fun bunk room and stunning pool, close to Eat Street. An address that every holiday maker would love, Seminyak hosts not just the perfect natural setting for a villa holiday but with the famous Petitenget beach just a stone’s throw away and the finest in local and gourmet cuisines in the downtown area that throbs with lifetime in the evenings. 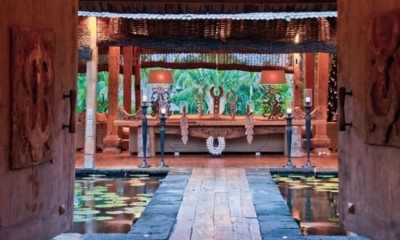 A haven for fashion aficionados, this is one Bali villa that shall throw open the vistas of the natural beauty of the region along with the culture and the modern lifestyles of the people all at once to make for a truly memorable holiday. Unique in itself, the Villa Tangram has six bedrooms of which five host king sized luxurious beds while one has a bunk bed set for four kids-juts the right option therefore for extended families holidaying together. While the master bedroom is right next to the dining room having an open air shower and bath unit, the handsome decor of the room itself is its most important feature while the luxury fittings and soft linen is a given in this villa with extreme high standards of comfort. Two other bedrooms have king sized beds and luxurious ensuite bathrooms with the best fittings and two others have twin bed sets. One of the rooms has been especially created for children or teenagers with bunk bed accommodation. All bedrooms have televisions, air conditioners and ensuite baths with rain shower facility as well as sinks and wash basins. The living room delights one with its semi al-fresco style setting in vibrant earthy colors like maroon and green. The adjoining dining area has a table to seat 12 and the kitchen has all the basic equipment to get going on a sumptuous meal planning. Embellishments on the wall and the super soft comfort of the chairs and couches makes this the ideal place to get together in the evenings for quality family time. Cooled by the fresh breeze coming through the large open doors, overlooking the jade green gardens , the mornings are great here as well as the bright sunlight infuses the interiors with its warmth and beauty. the outdoors makes the Tangram the ideal choice for large groups who need a space beyond the crowded market and beaches which they can call their own. Surrounded by the poshest of commercial district of Seminyak, the Villa Tangram however maintains its exclusivity being tucked into this region off the main road-called Jero 1001 complex in Jalan Drupadi- an address reserved for an exclusive holiday experience. Close by is the beach, the finest restaurants and the proximity of all modern fares for the younger crowd who may want to explore the night life more. A discrete staff that greets you at the entrance of the villa as you arrive will ensure that the place looks neat and well maintained right through. So be it the gardens or the pool, the bath or the dining room, you would find the staff of the villa quietly making every space look its best, especially making the place as child safe as possible. Apart from getting a breakfast each morning which is part of the package one could also opt for using the kitchen maybe with a bit of help from the maids to cook up something special for the family. Suited for a grand Balinese holiday, this Villa Tangram makes for a perfect escape to an eastern holiday tropical paradise that can be availed when the family wants to celebrate an anniversary together or when colleagues gang up to holiday together. Relax in tropical tranquillity and enjoy lush riverside living away from the crowds. With its lagoon pool and tropical gardens, this serene villa feels like a private paradise.